No-one believes and no-one supports our political institutions. Roberto Savio argues that we must think again about democracy and do something before it is too late. Only the New York Times looked at the last world survey on democracy and published a special report. But the information collected by the World Values Survey in 2015 is very worrying. In the US, the number of Americans who agree with ‘having the army rule’ has increased from 1 in 15 in 1995 to 1 in 6 now. 72 per cent of people born before World War Two gave democracy the highest score between 1 and 10. But less than 30 per cent of people born after 1980 gave democracy the highest score. And only 32 per cent of Europeans born after 1980 gave democracy the highest score. And in eastern Europe it was 24 per cent. They worried most about money, job security, and a pension – all more important than living in a democracy. Of course, we can explain this. Democracy was a victory for those who lived through the Second World War. Younger generations have only a small idea of what it means to live under a dictatorship. As the father of the European Union Altiero Spinelli said, now everybody can sleep at night. Too slow and too difficult? But in fact the situation is much more complicated. 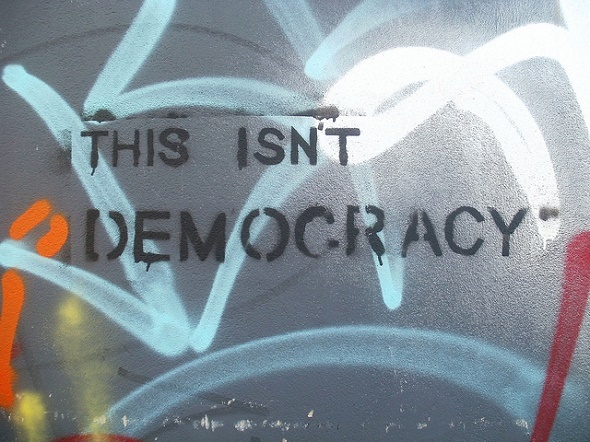 People think that when a country becomes a democracy, another system of government is not possible, because we think democracy is the only right form of government. And we think democracy gives us economic and social growth. The idea was that when China has a middle class, it will change to a multiparty system. But now more and more people are worried about the problems of democracy and the way it works. From time to time, someone used to talk about the advantages of the ‘Chilean model’ (based on Augusto Pinochet’s 1973-90 military dictatorship). Now they say the same about the ‘Chinese model’, which they think works better and is more productive than slow and difficult democracy. In Europe we have a Prime Minister of an ex-communist country, Viktor Orban of Hungary. He talks about how useless and out of date democracy is. And Orban was elected in free elections. Of course, Russia is a more important case. President Vladimir Putin is the first example of autocracy and enjoys popular support close to 80 per cent. And it is not reported enough that rightwing European leaders, from France’s Marine Le Pen to Italy’s Matteo Salvini, see Putin as a model – and they talk publicly about that. It is time to think about why people no longer believe or support political institutions. Is it just a generational problem, or is it also that we need to question the political system more and more? The US presidential campaign will cost $4 billion, and a small number of rich people will give the money. 130 families and their businesses gave more than half of the money raised by Republican candidates in the first eight months of the campaign. It is difficult to see how this is democracy at work in the US. In the World Values Survey, a third of Americans are now at the high end of the 10-point scale on the statement: ‘The US is not democratic.’ And outsiders including Donald Trump for the Republicans, and a socialist candidate Bernie Sanders have taken over the contest between Hillary Clinton and Jeb Bush in the presidential race. This new change shows the growing disconnection between people and old politics. The same surprises have come in Europe. Jeremy Corbyn won the Labour Party leadership in Britain, Alexis Tsipras’s leftwing Syriza party governs in Greece, and anti-austerity Podemos brought the end of two-party politics in Spain. There are two big divisions in the European Union between northern and southern Europe over economics (austerity versus development) and between western and eastern Europe over solidarity (refugees). These divisions are hiding the problem of how good or bad the European institutions are. A few people in Brussels decide the lives of millions of people without any discussion. In Greece the referendum cost Greece dearly. This is creating a third division more serious than the other two. Before the case of Greece there was the case of Cyprus – an example of things not being open for everyone to see and understand Embarrassed Eurocrats, including the head of the European Central Bank, Mario Draghi, had to accept they made a wrong decision with the financial crisis in Cyprus, and changed their minds completely by persuading the government. People now believe more and more that banks are more important than people after the first two Greek bailouts were really to bail out the French and German banks. In 2015, 3,178 bankers earned more than €1 million. 2,086 were in Britain. Most earned over €2 million; nine earned over €10 million. And there were $920,000 millionaires in 2014 in the world. What is new is that in recent years, very conservative institutions such as the International Monetary Fund (IMF) have warned that when inequality grows, it stops the economy growing. A study by the OECD found the same. The most recent IMF study warns that the middle class is getting smaller and the numbers of the very poor and the very rich are getting bigger. It is interesting that the World Values Survey found that 40 per cent of rich Americans agree with having a ‘strong leader who doesn’t have to worry about Congress or elections’. In 1995, the number was 20 per cent. The middle class is getting smaller and politics is getting more extreme. There are more and more extremist and xenophobic parties, which now get votes from workers and the poor, who once voted to the Left. This is completely changing politics. It is difficult to believe that Denmark does not want refugees because of the views of its rightwing party. It is one of the few countries in the world that gives one per cent of its finance to development aid (the US gives 0.2 per cent). It is also difficult to believe that Hungary would act in a way which makes us remember Nazi times. And it is difficult to believe that eastern European countries say openly that they are in the EU to get something but not to give anything. Democracy started from the ideas of justice and solidarity, and the development of society. We cannot see from past history what will happen when the situation in society gets very bad over many years and the young do not see a clear future. But we can see from past history that a society in crisis can easily move into an authoritarian regime, especially if the rich support it. Everyone must see nw that the system is broken, and needs fixing. But will democracy with so few states people and so many politicians fix it? This is a question that we must ask. Roberto Savio is the president of the Inter Press Service news agency and publisher of Other News. NOW READ THE ORIGINAL: http://newint.org/columns/essays/2016/03/01/democracy-revival-needed/ (This article has been simplified so the words, text structure and quotes may have been changed). This page was last edited on 4 April 2016, at 10:17.